Poor Joe Burrow. 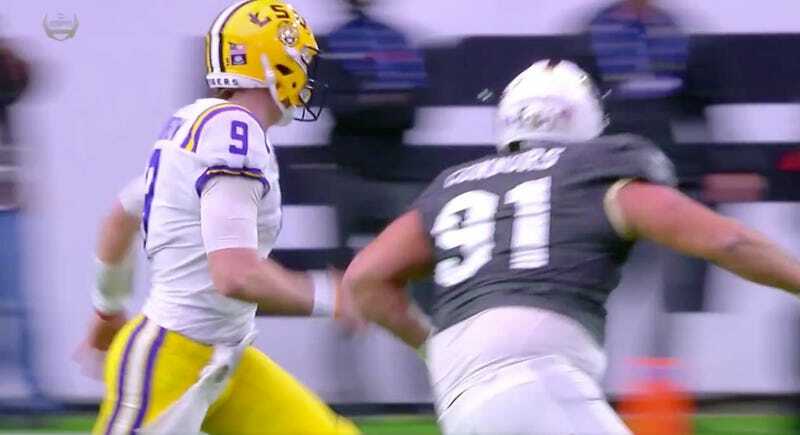 The LSU quarterback led his team on a long drive into the red zone in the first quarter today, only for it to end in horrifying manner. His receiver slipped and Burrow simply boinked up the throw, sending the ball directly to UCF defensive back Brandon Moore, who scampered 93 yards all the way to the other end zone. Burrow might have been in position to make a play on Moore early, but he got rocked by Joey Connors. Officials examined the play and eventually deemed the hit legal. Thankfully, Burrow returned for LSU’s next drive, and capped it off with a gorgeous 22-yard touchdown pass to Justin Jefferson.